This is a fun educational game and science experiment which combines the sensory fun of water play with observation of the objects tested. A large bowl, plastic container, or sink filled with cold water. Different objects that sink and float e.g. cork, sponge, stone, small plastic objects, metal spoon, paper clip, key, stick, wooden objects, etc. Or to laminate an A 4 cardboard, draw a line in the middle and to label it ‘Sink’ , “Float”. 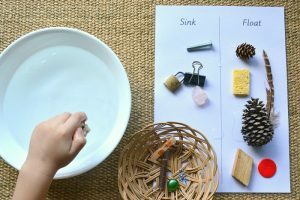 Ask your child to place each object into the bowl of water and then to place the objects on the left of the mat that sink and the objects that float on the right of the mat. Children are always eagerly to participate in water play . What a great way to teach your child about which objects sink or float and to teach them how to classify !